Congratulations are in order for the Will & Grace actress Megan Mullally. And Tuesday night was obviously a special night for the actress. The 59-year old actress not only won the award for Best Actress in a Supporting Role-Comedy or Musical from the hands of her husband, but her receiving speech was another load of encouragement for women and girls across the globe. The Alliance for Women in Media Foundation handed out the 43rd Annual Gracie Awards on Tuesday, May 22 at the Four Seasons Beverly Wilshire Hotel in Los Angeles. I want to say to women and girls, you have no limitations. You can do whatever the hell you want to do. Be collaborative but do it your way, just the way you like it. Learn how to say no, but most importantly, learn how to say yes. 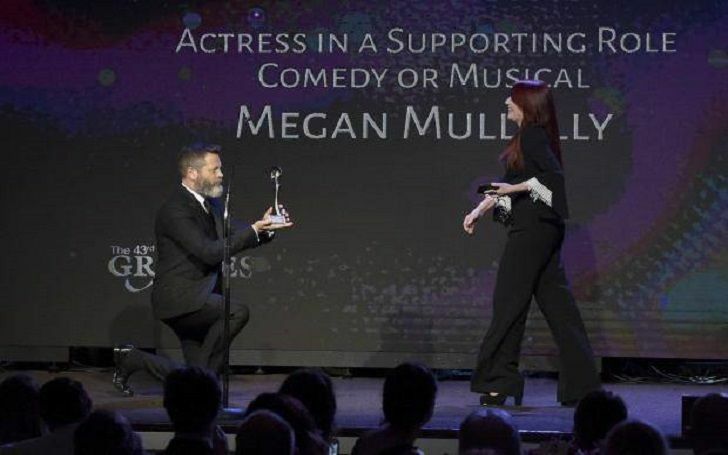 Megan received the honor from his husband Nick Offerman who went down to his knee on stage as he offered his wife the honor. From the record-setting attendance at the Women’s March to the wave of sexual misconduct allegations that empowered women to speak their truth, to gender inequality and the wage gap being thrust into the spotlight. And from there, we’re about to make history this year for the record number of women running for public office. Other honorees were Rita Moreno who received Gracie's Lifetime Achievement Award, Pam Oliver - award for Best On-Air Talent, Entertainment/Sport, Elizabeth Smart - the Gracie for Best Producer, Non-Fiction. Elizabeth Beger along with seven of This Is Us' writers received an award for Best Drama from the hands of Loni Love.